An octopus has made a successful dash for freedom from a New Zealand aquarium and is now thought to be roaming the Pacific Ocean. Inky the octopus took his chance to escape through a small gap in his enclosure at the National Aquarium in the coastal city of Napier. After managing to squeeze his way out, Inky slid across the floor and found a 15cm-wide (6in) drain pipe which - luckily for him - led to the sea, the Stuff.co.nz website reports. Aquarium manager Rob Yarrall says the tank's lid was left slightly ajar following maintenance work. "He managed to make his way to one of the drain holes that go back to the ocean and off he went - didn't even leave us a message," he tells Radio New Zealand. Staff later found "octopus tracks" which revealed Inky's escape route. The breakout happened earlier this year but only came to light in the national press on Tuesday. While Inky's body is about the size of a rugby ball, he's considerably more squishy and can get through seemingly impassable spaces. "Even quite a large octopus, they can squeeze down to the size of their mouth which is the only really hard part of their body," he says. "It's a beak, very much like a parrot beak." 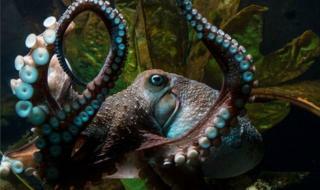 Of the aquarium's two octopuses, only Inky decided to take his chances on the outside, leaving his tank-mate behind. Mr Yarrell says it's the first escape he's experienced at the aquarium, telling the Hawkes Bay Today paper: "Yes, it's most unusual and yes, we'll be watching the other one."